Skopelos is officially the greenest of all the Greek islands, its interior lush and verdant, the hills thick with pine, fruit and nut orchards and olive trees. Even though some like to call it the new Corfu, Skopelos has successfully evaded both holiday cachet and mass tourism for hundreds of years. Bizarre question of the week: will that now change with the release of Mamma Mia, the movie version of the West End stage show which was filmed here last year? Locals still talk about the month big Hollywood stars such as Pierce Brosnan, Colin Firth and Meryl Streep blew into sleepy Skopelos Town, where the culinary speciality is a vegetable pie made by spreading a paste of mixed greens, egg and cheese on to sheets of filo pastry, then rolling it up and curling it into a spiral, like a Cumberland sausage. Dainty it ain’ty. In the dusty ouzerie on the outskirts of town, another custom is to eat dried plums stuffed with a sprig of basil, alongside glasses of milky ouzo. Tradition has it that afterwards, the basil must be tucked behind the ears for good luck. Anyone with a photograph of Meryl doing this, send it to me now. Brosnan rented a villa on the south-facing hills opposite the harbour and apparently liked it here so much he is scouring the island for a property. Other stars stayed in rooms in town; in the pretty, sunbleached streets that zigzag back from the harbour, like an amphitheatre. Mamma Mia’s climactic scenes were shot near the Ag. Ioannis monastery on the north of the island, with its extraordinary, eyrie-like chapel set on a rock over the sea. Here, locals were paid 70 euros per day as extras; not enough, some say, to toil up and down the 120 steep chapel steps in the grilling heat. Cafe of Skopelos. It is also an uncommonly beautiful restaurant. Ferociously clean, it has simple traditional furniture, crisp lace curtains and an incredible, blue on blue view over miles of Aegean, where the unseen seam between sea and sky is occasionally marked by dots of misty, navy islands. The Stamataki family have run this restaurant since 1953; Mr Stmataki - the current chef - began cooking when he was 15 and his son Nikolas is a restaurant consultant who brings back new ideas from London now and again. I imagine that the balsamic splashes on the steamed octopus and the dusting of icing sugar on the chocolate sponge are Nikolas's work, but Skopelian tradition elsewhere on the menu resists assault. Dishes include slow roast kid with black artichokes; marinated anchovies with salad; veal simmered in tomato sauce; chicken dolmades (braised chicken breasts stuffed with sun dried tomato and smoked cheese, then rolled in vine leaves); grilled pork fillet with wild fennel sauce; stuffed aubergines; and pork roasted with wild plums. Agnanti is completely different from any other eating establishment on the island and one of the most famous restaurants in the whole Aegean. 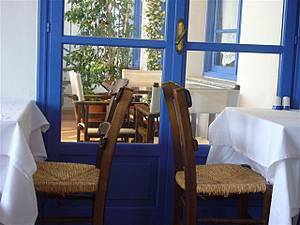 The cooking is lighter and finer than you will find in the hearty tavernas of Skopelos, while the prices are remarkably low for the quality of what is on offer and the stunning location. To begin, we have delicious savoury herb fritters with a fluffy texture that belies the pungency of their flavour. A rectangle of local feta cheese is posted inside a slim envelope of crackling, golden filo pastry then fried and drizzled with a dressing made from sweet wine from Samos and scattered with almonds. Most extraordinary is a sea fennel salad; a pure-tasting mixture of samphire, caper leaves and berries. 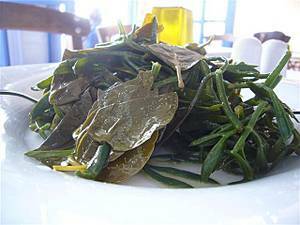 The Skopelian samphire (or sea fennel, as they call it) is not as coarse as the type we get in the UK and is hand picked from the scarps and sheer cliffs on the island; a dangerous business. The fronds are then blanched in a huge pot, plunged into cold water and stored in salted water until needed. The same treatment is applied to the capers and caper leaves. Then all is rinsed, dried and dressed with oil and vinegar and simply served with lemon. It tastes so richly healthy you can feel your kidneys conga with joy as you eat it. Octopus is marinated in vinegar then slowly steamed to give a perfect texture. I don’t think the balsamic brings much to the party, but that’s only personal preference. For main courses, we have crisp pork belly dressed with a sweetish mustard sauce, while exceptionally tender pieces of lamb are scatterd over home made flat bread and dabbed with a sun-dried tomato paste with a hint of spice. Everything is of excellent quality and attention to detail is everywhere. Even the simple, home-made almond cake is a revelation; light as air but fragrant with cinnamon and drenched in honey. Do I want another slice? Mamma Mia, here I go again. My, my. How can I resist it? The wine list is well chosen, beautifully laid out and packed with information. From a dizzying selection from all over Greece, we have a full-bodied, apricot- rich Domaine Sigalas Santorini 2007 which, at 24 euros, was at the top end of the list. If you come to this beautiful island, then you must come here; to properly taste the flavours of Skopelos or even just to have a drink on the terrace, which is particularly lovely at sundown. 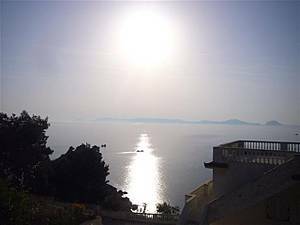 Agnanti Bar Restaurant, Next to the town hall, GR-370 04, Glossa, Skopelos Greece . Tel: +30 24240 33606. Lunch or dinner for two, including drinks and service, 50 euros.